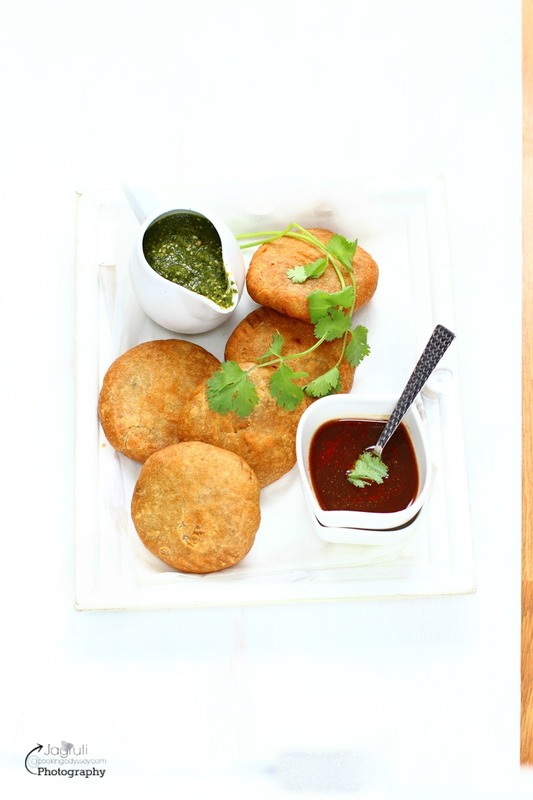 Aloo Matar Kachori, good old kachoris with good old masala chai. 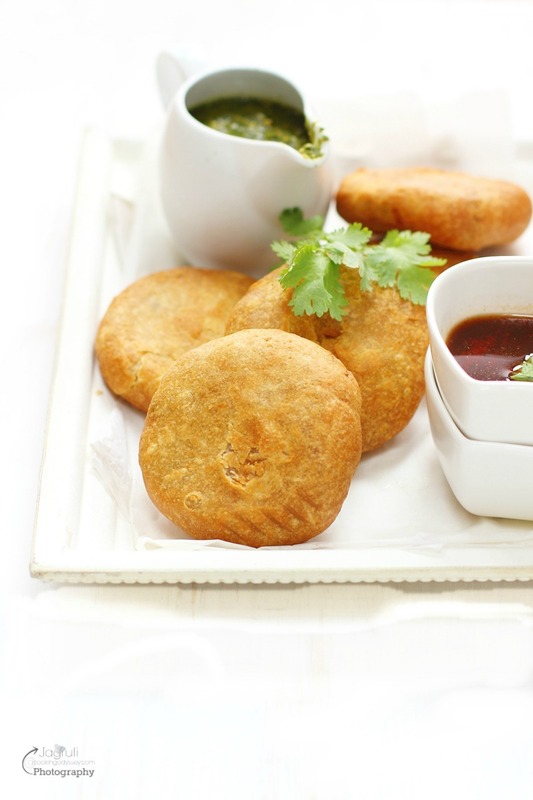 Flaky and crispy, it tastes delicious by itself or can gobble a couple of them with lip-smacking hot green chutney and tangy Tamarind Chutney. It is well known that Indian street food Samosas have broken all geographical and culture barriers to become world famous but well made kachori can beat samosa any time ! 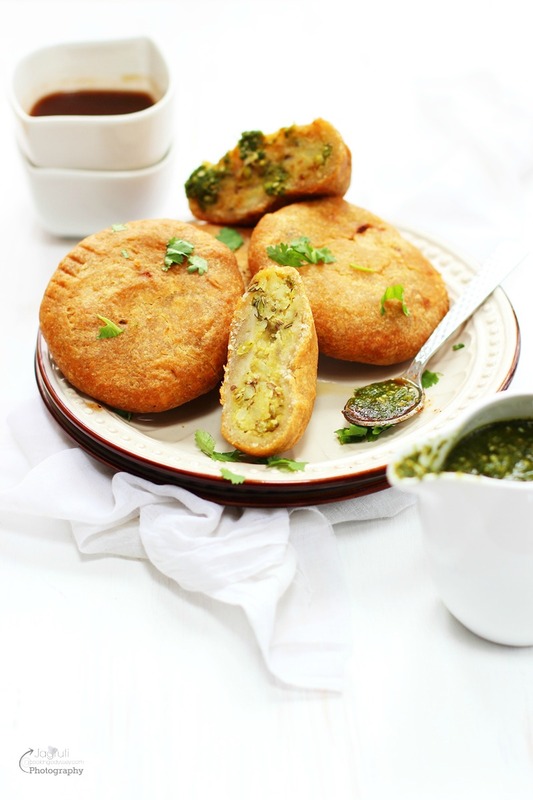 These kachoris are deep fried pies stuffed with delicious and flavourful filling made with mashed potato, green peas, aromatic herbs and spices. It's been a long time since I fried some kachoris, and definitely it was worth the effort as they came out so well, so flaky, crispy and crumbly and surely packed with so much flavour. In Gujarat, these delicious kachoris are served as a snack any time of the day and sometimes it takes place as Farsan in Gujarati Thali. In the past I have prepared Garlic Kachori, Poha kachori and Dry fruit Kachori , they were phenomenal !!! 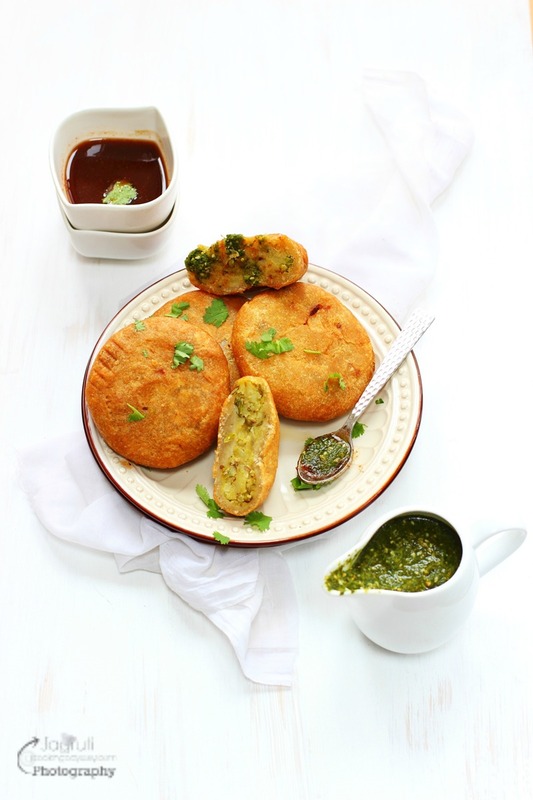 Let's make Gujarati Khasta Aloo Matar kachori, straight from the streets of Gujarat, this kachori will knock your socks off !! These kachoris will stay fresh only for one day, do not store. Heat less than 1/2 tsp. oil in a pan and lightly roast the 2tbsp. whole spices, let it cool. Grind roasted whole spices in a grinder, keep it coarse . Mix with sesame and Poppy seeds. Heat 1 tbsp. oil in a kadai, add cumin seeds, once they crackle add hing. Add crushed chilli and ginger and cook for few seconds, add coconut and fry less than 2 seconds or it will burn. Now add mashed potato and boiled green peas, 2 tbsp, freshly ground garam masala, salt and sugar. Keep low heat and mix well. Add dry mango powder ( amchoor ) or lemon juice and mix well. Sprinkle fresh coriander leaves and leave it aside to cool. Meanwhile prepare the dough by mixing plain flour, salt and melted ghee, mix well and knead the semi stiff dough. Cover with the clean kitchen towel and rest it for half hour. Roll out each dough portion into a small circle. Put one big spoonful of the filling portions into the centre, then fold the dough over the filling to form a ball and seal the edges with a peak at the top. Now heat oil in a wok or kadai and deep fry 3-4 kachoris at a time over medium heat till they are light golden brown in colour. 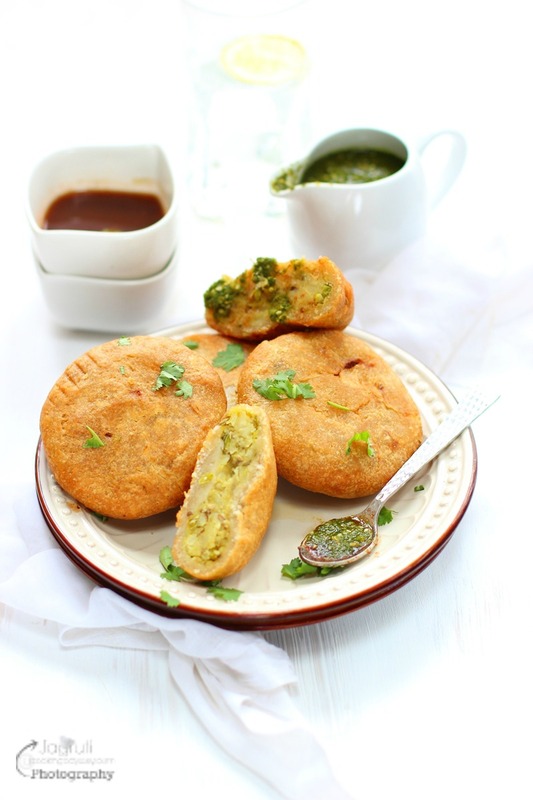 Enjoy hot Khasta Aloo Matar kachori with green coriander and tamarind chutney. These look SO good, but I've never seen mango powder before. Where can I buy that? Thank you Ryan, you can get mango powder any good Asian supermarket. Highlky energetic article, I enjoyed that a lot. Will there be a part 2? With this nitterly cold weather, I would love a plate of these katchoris with hot masala tea.They look so crispy and delicious.